There’s nothing better to curl up in while watching a battalion of massive men smash into each other on the gridiron than a blanket with sleeves. 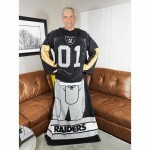 If you’re going to look ridiculous in your own living room, you might as well support your team with these NFL Snuggies. They’re just like blankets except you have the freedom to move your arms to grab a drink, snack, remote, gesture at the refs, flex, or cover your face in shame.